The slick shape of a Porsche 911 does not drive by without turning heads. Their shape is instantly recognizable as an icon to luxury cars. These high-performance beauties come in 24 different versions, and the Porsche 911 GT2 RS is one of the newer, favorite ones. The sports car has been in consistent developments since the early 1960s and the vehicle is known to have a flat six-cylinder boxer engine with rear engine power. Eurofest 2018 was recently held in the Gold Coast Region at the beginning of June. All Porsches were on show as the festival celebrated fast cars and shared knowledge about these wonderful machines. Amongst these cars on display was the Porsche 911 GT2 RS which flaunted its beautifully designed attributes. The vehicle has a roaring horsepower of 700 with a rear wheel drive, with four-wheel steering providing the advantage of smooth stability and the ability to make smaller turns. It is no surprise that the Porsche 911 GT2 RS stole the show! The interior of the Porsche 911 GT2 RS is top class with their precise ergonomics and readily available information. The sporty design offers optimal and quality comfort. The sports steering wheel works with gearshift paddles to allow for precise and efficient turns and movement. The combination of black and red high-quality material adds to the overall sporty feel. The full bucket seats are electrically height adjustable to suit your comfort and improve your riding experience. The seats are upholstered in black leather with red Alcantara® edgings in the headrest (with the GT2 RS logo) to match the slick splashes of red in the interior. In addition, the Porsche Track Precision App guides the driver to improve their personal performance by recording, displaying and analyzing detailed driving statistics. The Porsche 911 GT2 RS is full of personality and charm. The engine produces an astounding 515 kW, or 700hp, at a rpm of 7,000. The iconic rear wheel drive of the Porsche 911 GT2 RS boosts the machine from 0 to 100km/h with 2.8 second acceleration, and only 8.3 seconds will bring the vehicle to 200 km/h. The twin water-cooled turbochargers consist of variable turbine geometry which is arranged in a parallel manner as to direct the incoming exhaust gas towards the turbine wheel. This allows for optimum aspect ratios regardless of the operational state. The variable turbine geometry allows a refined response to the build-up of charge pressure. Although ready to pump adrenaline into the heart of sports car fans, the Porsche 911 GT2 RS prioritizes safety. The Porsche Ceramic Composite Brake (PCCB) consists of cross-drilled ceramic brake discs for an incredible braking performance. The PCCB equips the vehicle for shorter braking distances, with improved safety for braking at a high speed. This is largely credited to the extremely low weight of the discs which are approximately 50% lighter than standard discs of similar design. Ultimately, PCCB discs have better road holding, improved comfort, and smoother handling. 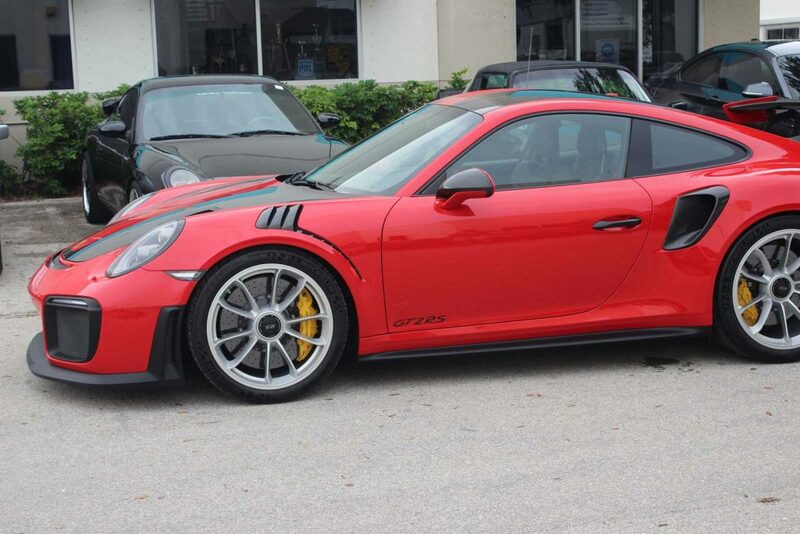 In addition, the GT2 RS has a club sport package for increased safety. It consists of a six-point driver’s seatbelt, a fire extinguisher and bracket, and a roll cage screwed to the bodywork behind the front seats, adding additional peace of mind when taking the fiery machine for a spin. The incredible body reaches a height of 1,297 mm supports expands across 4,549mm, pushing up to 515kW and 700 PS hp. Maximizing at 7,000 r/min and reaching a top speed of 340km/h – it is no wonder that the 911 GT2 RS is a new favorite among the Porsche range. The most powerful 911 ever made, the GT2 RS will leave blisters on the track with a sound that’s ‘pure Porsche’. The rear-mounted 3.8-liter twin-turbo flat-six-cylinder engine puts the vehicle in its own league, and driving it is an exhilarating experience.